I have no idea where this recipe came from. Does this ever happen to you? It’s in my own writing. I found it in “The Cooking Decade,” a binder of family recipes that my older sister gave me. It’s one of the recipes that I added, and like all other Cooking Decade recipes was pre-tested and family-approved. Yet I have no recollection of making it, naming it, or writing it. But who else would make a dressing with no oil, using simply lime juice, tamari, and garlic? Certainly not a professional chef. Doubtlessly it was created during hot weather when our CSA supplied us with plenty of Napa cabbage and we had limes on hand. On a day like today. When making the salad, I discovered that our “medium head of Napa cabbage” had been severely eaten by small critters on the inside. Although this proved the cabbage was delicious and perhaps nutritious, I was concerned about the skimpy quantity. So I sliced up a medium bunch of bok choy to go along with the cabbage. This substitution added a pleasing bittersweet note. Feel free to substitute bok choy, tatsoi, or any other fleshy Chinese green for part of the cabbage, but don’t overdo it. This salad is light but the chicken and sesame give it substance. It’s mild, even with the jalapeno. If you like things a bit spicy, be sure to cut up some extra jalapeno for the topping. In fact, the toppings are key to the recipe, so don’t skip them, especially the lime. Accompany the salad with some steamed veggies over rice if you like, or a crusty wholegrain bread, or even garlic bread. Cut Napa cabbage in half and slice thinly. You will have about 7 - 8 cups. Grate carrots. You will have about ¾ - 1 cup. 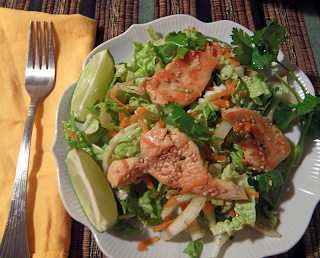 Toss cabbage, carrots, chopped chives, and cilantro leaves together in salad bowl. To make the dressing, mix together lime juice, tamari, garlic, and minced jalapeno. Add a few grinds of salt and pepper and stir. Set aside. Heat a no-stick sauté pan on medium high. When hot, add sesame seeds and toast, stirring constantly until they start to darken, about 3 minutes. Remove to a plate to cool. Cut chicken (or turkey) into ½ inch strips across the grain. Cut the longest strips in half crosswise, so that pieces are more or less equal in size. Heat large sauté pan on medium high heat. Add olive oil and chicken. Lower heat to medium and sauté on both sides until golden brown, about 9 minutes. 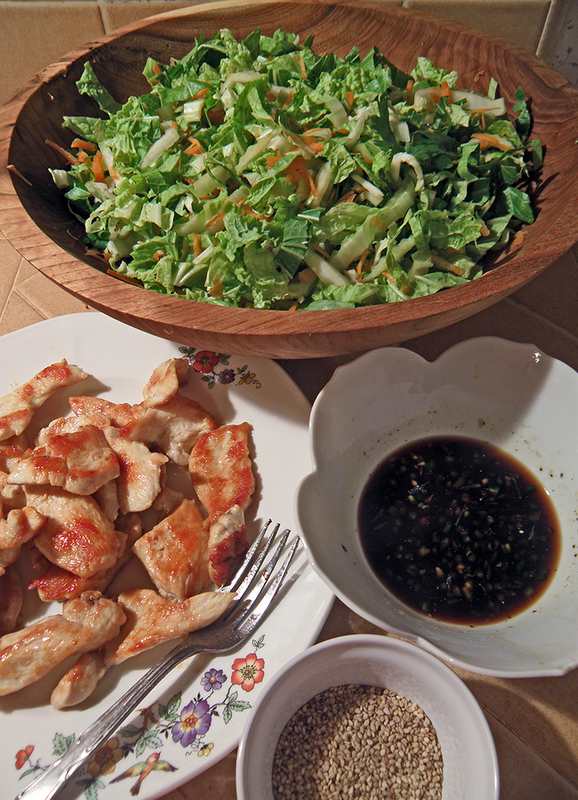 Remove chicken to plate and let cool a bit so it won’t wilt the salad. 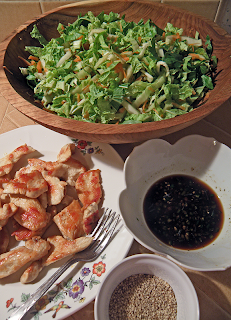 When cooled down to warm, top salad with chicken pieces. Pour dressing over salad. 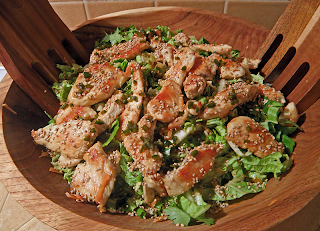 Top with sesame seeds. Toss salad. Serve with extra lime, cilantro, chopped chives, minced jalapeno, salt, and pepper at the table.